Gather 6 to 50 of your colleagues to battle it out in the kitchen at Tre Wilcox Cooking Concepts and let the games begin. Cooking brings people together, and a little friendly competition brings out the best (or worse) in everyone. Chef Tre and his team of chefs will guide each group along as they prepare a meal together. Upon booking your cooking competition, you are assigned your personal front of the house manager/porter and a dishwasher. Teams need a little inspiration or guidance? 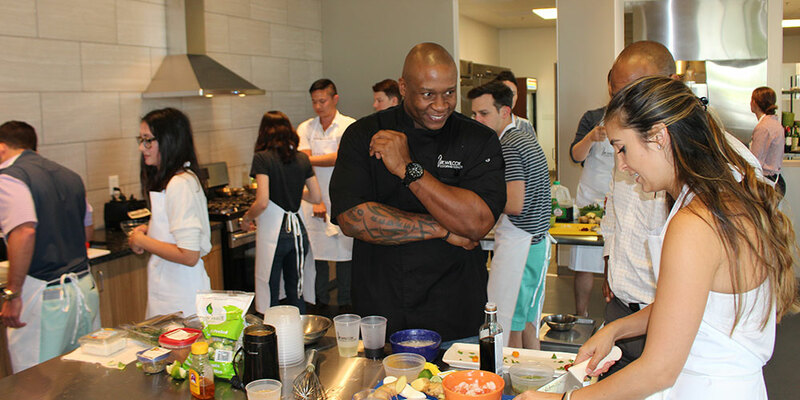 Chef Tre offers his personal advice from his appearance on Top Chef and Iron Chef America. Chef Tre is your emcee for the competition, going from kitchen to kitchen asking contestants about their choices and strategies. And if the teams are at a loss, leave it to the expert to do an impromptu demonstration for inspiration. Team Building events can be held in the afternoons and evenings. It’s a unique and fun way to get to know your coworkers. Iron Chef Battle – One secret ingredient. Access to pantry staples. Each team has 45 minutes. When the time is up, present two dishes to our special celebrity guest judges. Dishes are judged on creativity, taste and presentation. Then there are the “tres” cool points – extra credit for going above and beyond. 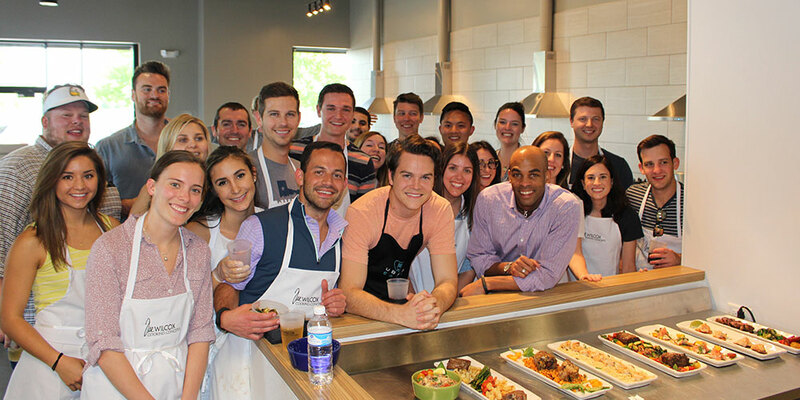 The winning team gets a culinary-inspired grand prize and goes back to the office with bragging rights. Market Basket Challenge – A basket containing who knows what put teams’ creativity to the test. This is Chopped, but Tre Wilcox style. Contestants have 45 minutes to turn clashing ingredients into one edible dish. Celebrity guest judges rank team dishes on how well the ingredients were incorporated, creativity, taste and presentation. Plus, the “tres” cool points – extra credit for any wow factor. The winning team gets a culinary-inspired grand prize and the rest get chopped. Family Dinner – If competing with knives in hand isn’t your group’s thing, there’s the Family Dinner team building option. No competition. Just a low-key event that ends with everyone sitting down together for a meal, family dinner style. Each team is responsible for making one course of the meal. No judging. No pressure. Family Dinners have a theme, could be anything from New York Steak House to New Orleans Cajun Feast. Two menu styles are offered: a chef-crafted buffet of choice or a 3-course plated dinner. Everyone is a winner and everyone goes back to the office with a full belly.